Years ago, I had a first date at Sushi Tei Takashimaya. That was when the restaurant was still hidden behind the crowded taxi stand. Time flies. 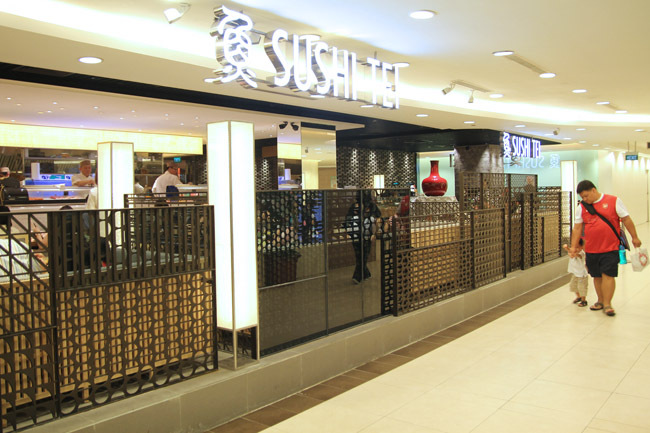 The Sushi Tei chain of restaurants has already been around since 1994, with 15 outlets in Singapore, and a new larger premise on the fifth floor of Ngee Ann City. They have just launched a “We Are Back!” promotional menu with exclusive specialties available only at Ngee Ann City. And since this is ‘Sushi’ Tei, here are three recommended sushi dishes. 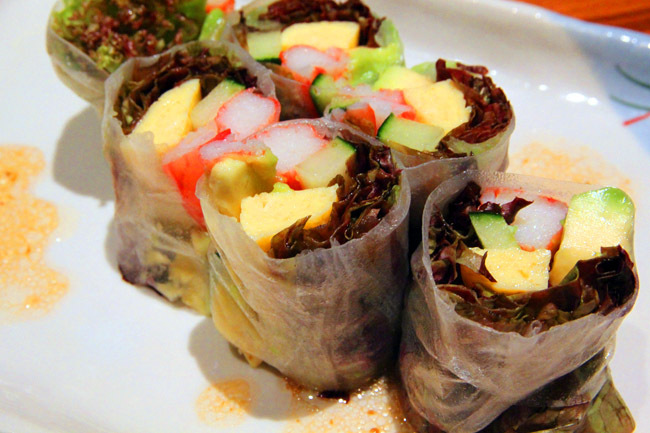 The Vietnam Harumaki ($8) is a cross between a Vietnamese spring roll and maki, and should delight non-carb lovers with its rice paper wrap with avocado and crab meat fillings. I really liked this refreshing sweet Harumaki especially (eemmmmm) I can never finish the rice on my sushi. Please tell me you do it too. 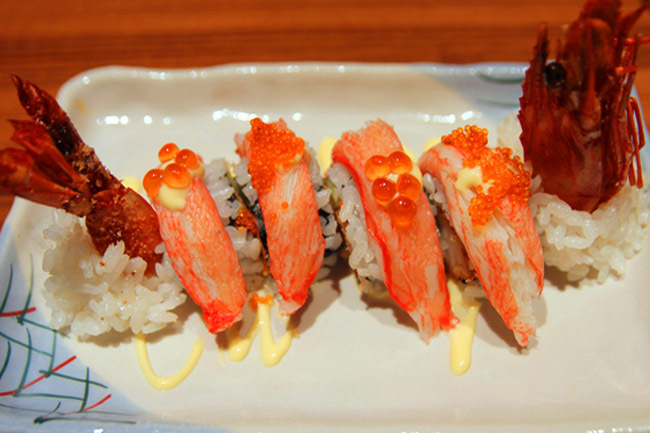 The Kurenai Roll ($12) is presented like a flying dragon. Just when I thought it was only a pretty thing till I had a bite, and was surprised by the crunch of crispy deep-fried breaded sashimi-grade prawns on the inside. Definitely a pleasing “wow” moment. Plus there was a sweet aftertaste since the sushi was rolled with sweet mango and cucumber. This Kurenai is both beautiful and appetizing. The table’s favourite seems to be the Kani Mentai Mayo Roll ($8) – it already sounds good. 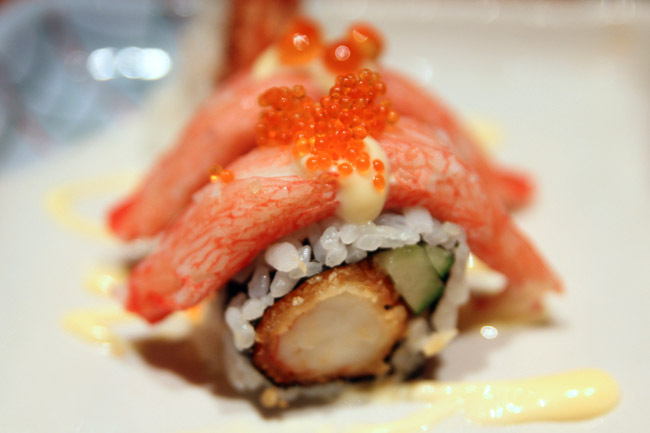 Imagine a uramaki where the rice is on the outside, seaweed sheet on the inside, topped with generous mentai mayonnaise cod rice, and crowned with crispy thin fried carrot shreds. Sushi Tei has always been comfort Japanese food. And if I feel like going light, the Sushi Tei salad with Zuwai crab meat and thick slices of salmon sashimi, topped with goma or special citrusy sauce is a must-have. 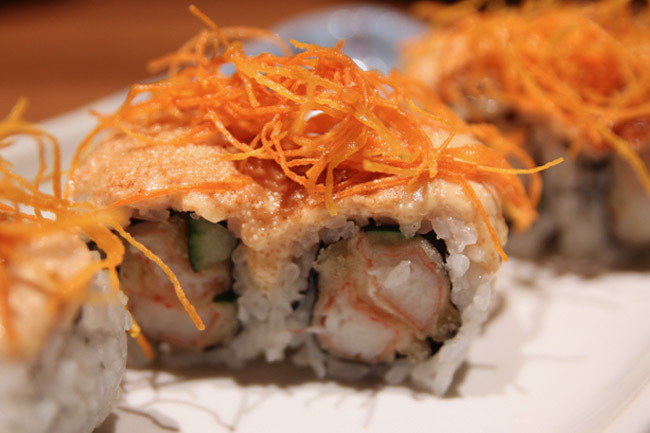 How about you – where do you like to go for your sushi fix? I love this kind of food.